Good. This book is in stock now in our UK premises. Photos of most of our books are available-please ask, as dustjacket and cover illustrations vary and the pictures you may see are often not ours. Overseas buyers also note that shipping rates apply to packets of 1Kg and under, and should the packed weight of an item exceed this we reserve the right to ship via 'Economy', or cancel, or request extra postage prior to fulfilling the order. 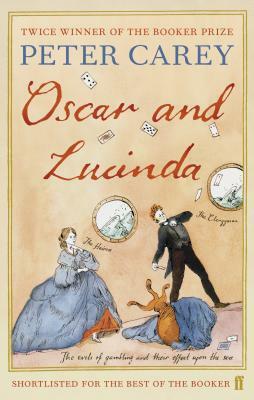 Peter Carey's wonderful historical fiction Oscar and Lucinda is something that some readers may pass by because of the average treatment it received in the cinemas. Pass by at your peril - it's a great read (though occasionally a bit off, researchwise) that speaks of gamblers, gambling and the opening up of Australia, over a century ago. Carey, a former advertising bod, has a simple, clear style that manages to convey something of the interconnectedness of life without sounding either preachy or smug. With a structure that mimics Patrick White's Voss, Oscar and Lucinda is a gambling-and-glassworks wonder, with more life on the page than on the screen.